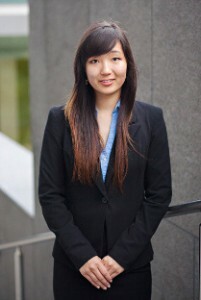 Angela Meng is a junior majoring in BHP and MIS. This year she serves as the Professional Vice President for the Asian Business Students Association (ABSA). She has been very active in the organization since her freshman year and continues to do more each year out of a love for the organization and a desire to give back. Angela attended Plano Senior High School and first became interested in the BHP through her older sister who went through the program. She ultimately chose BHP over other schools she had applied to because of the prestige of the program and the positive experience her sister had. Angela’s sister had encouraged her to check out ABSA, and she was blown away from the very first meeting by the commitment the officers had for the organization. She fondly recalled her first ever general meeting where the officers dressed up in business professional under 100 degree Texan weather to present in front of the organization as a memory that inspired her to grow to become as dedicated as they were. As a freshman, she got involved with planning their company field trip and helping with Scoring Careers, which involved cold calls to companies and a lot of logistics work. The position forced her to get out of her comfort zone. After serving last year in an internal role as social director, she returned to the professional side, serving as Professional VP this year. In this role, she manages a committee organizing company general meetings, Scoring Careers, professional workshops and company field trips. Scoring Careers is a joint event with HBSA that happens the day before the McCombs Career Expo. It is a more casual event, which aims to put everyone, especially underclassmen, at ease before the official career fair. The event faced many challenges this year, and Angela was proud of the success of the event which she attributes to the hard work of many students who were involved in planning the event. Angela has also been involved in UT’s Madrigal Dinner for the past two years, singing and acting in a 57-member cast. The dinner/performance takes place over just one weekend, but the group rehearses all of fall semester for it, putting in about 10 hours a week of rehearsals. “I happened upon it by chance, but it is a great source of stress relief for me, and it helped me make friends with students from other majors,” said Angela. She already completed one internship after her sophomore year with Ericsson, working in sales support, and she will be interning this summer with Accenture in a management consulting role. Sales was never something she thought she was incapable of doing, but she learned from the internship that she was capable and even enjoyed sales work. She also enjoyed learning about Ericsson’s cutting-edge technology.